Founded in 1937 by William Shirley Fulton, the Amerind Foundation is a private anthropological and archaeological museum and research center dedicated to the preservation and interpretation of Native American cultures and their histories. Fulton’s home in the spectacular Texas Canyon in southeastern Arizona became the Amerind. Its exhibitions tell the story of America’s first people from the Alaska to South America, from the last ice age to the present. A permanent exhibition Images in Time and Place is installed in the principal gallery of the Museum. “Time” includes objects from prehistoric, historic, and contemporary contexts, and “Place” encourages the visitor to think about the environment of the cultures represented. The exhibition presents rich figurative designs in textiles, organic fibers, clay, stone, wood, ivory, metal, beads, and leather. A hallway, connecting the two galleries on the first floor, contains exhibit cases showing a time-line of prehistoric human occupation in the Southwest. 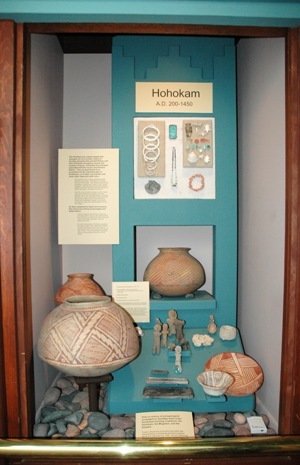 Here visitors see artifacts from the time of the Paleo-Indians, the Archaic period, and three primary cultural areas of the early farmers: Hohokam, Mogollon, and Ancestral Pueblos (formerly “Anasazi”). The Archaeology Room showcases the archaeological work done by the Amerind over the years, including Fulton’s early explorations on the Amerind property, and his work at Painted Cave with archaeologist, Emil Haury. Excavations by Charles Di Peso, director from 1952 to 1982, include his work at Casas Grandes in Chihuahua, Mexico, and his excavations along the San Pedro and the Santa Cruz rivers. This room contains items dating between 800 to1600 years ago, including baskets, sandals, cordage of human hair, and cloth, which were left in a dry cave with superior preservation properties. The main gallery upstairs, the Ethnology Gallery, contains items from different Native groups. Part of the room is dedicated to the Apache culture, and on display are baskets, a bow made and signed by Geronimo, a set of Apache rawhide playing cards, along with information and interpretation about the different Apache tribes and groups, Geronimo’s surrender, and the resulting confinement of the Chiricahua Apaches. The Navajo are represented with a small collection of jewelry and an exhibit of concho belts. The Ethnology Room contains examples of beadwork by various Native people along with fetishes, cradle boards, pipes, and Santos and other religious artifacts, mostly from northern New Mexico. The Hopi drawings on Paper exhibit features art by various Hopi artists, including many works by Otis Polelonema. Hopi paintings on paper started when archaeologist Jesse Walter Fewkes, who was researching katsinas (or, kachinas) at the end of the 1800s, asked several Hopi men to draw pictures of katsinas. Around 1915, two young Hopi students, Fred Kabotie and Otis Polelonema were invited to participate in the after-school art classes in Santa Fe, provided by Elizabeth DeHuff. She provided paper and supplies and encouraged them to draw whatever they wanted. Polelonema returned to his village in 1921, and although he continued painting, fulfilling his responsibilities in his community was more important to him. Kabotie remained in Santa Fe and pursued a career in art, returning to Hopi in 1937 to establish the Hopi Silvercraft Guild as well as an art program at the Oraibi Day School. The exhibit also includes works by Waldo Mootzka, Raymond Naha, and others. Katsinas carvings are also on display. Traditions in Clay is an exhibition of Pueblo pottery ranging from late prehistoric ancestral ceramics to modern pieces. The prehistoric pottery ranged from simple utility jars to intricately textured and painted wares. The art form was revived with the arrival of the railroad and tourists in the 1880s. Contemporary pueblo potters still use centuries-old techniques and are inspired by pottery designs a millennium or more old. The Mata Ortiz Gallery contains two exhibits. The Potters of Mata Ortiz: Inspired by the Past and Creating Traditions for the Future. The first exhibit explores the connection between the pottery of the prehistoric town of Casas Grandes in Chihuahua, Mexico, and the contemporary pottery tradition of the village of Mata Ortiz. The second exhibit illustrates Amerind’s early involvement with the community of Mata Ortiz. In 1978, Spencer MacCallum asked Charles Di Peso, Amerind’s director, if the Foundation would be willing to support a competition for the potters of Mata Ortiz. Di Peso agreed and Spencer brought several truck-loads of pots, while Di Peso selected the judges. The judges picked the winners and Spencer returned with ribbons and prizes to award the winners at a community festival. The exhibit features photographs from the judging and the awards ceremony, along with pots by some of the winners. A Maker of Wagons, A Maker of Memories exhibit shows the work of Tohono O’odham folk artist, Matias Chihuahua Gomez from Caborca in Sonora, Mexico. Matias, recently deceased, made delightful miniature wagons from mesquite and other woods which resemble the wagons from his childhood. The Fulton-Hayden Memorial Art Gallery houses the Fulton family’s art collection. Rose Hayden Fulton, the wife of William Shirley Fulton, collected the fine art that now fills the gallery. One area is dedicated to changing exhibits of Native American artists including Harrison Begay, Beatien Yazz and other Navajo artists. Other artists who have exhibited in this space include Mike Chiago and the late Leonard Chana, Tohono O’odham artists; Melanie Yazzie (Navajo); Mike Zillioux (Akimel O’odham); Terrol Dew Johnson (Tohono O’odham); Bunky Echo-Hawk (Pawnee/Yakima) and more recently, Our People, Our Land, Our Images, an exhibit of work by twenty-six international indigenous photographers. The And Then, There Were Horses! exhibit showcases paintings done between 1940-1970 by Navajo and Apache artists, including Allan Houser. The remaining rooms in the art gallery are filled with works by William Leigh, Carl Oscar Borg, and Frederic Remington and many others. The portrait room exhibits paintings of the Fulton family. The non-circulating Fulton-Hayden Memorial Art Gallery & Library is home to a 22,000 volume collection of books and professional journals. The library’s strength is in anthropological and archaeological literature, as well as titles that provide information on the Amerind’s ethnographic object collection. Researchers need to make an appointment to use the library’s resources. The library has a wireless internet connection for scholars with their own laptops. The Amerind Museum Store carries only authentic, museum-quality American Indian made arts and crafts. The store sells books on Native American culture, archaeology, and the Southwest, fine art posters and music CDs from Native American artists. A picnic area is available for visitor use.